Twenty-four years ago, on June 4, 1989, hundreds possibly thousands of China’s most idealistic young people were massacred on Tiananmen Square by the People’s Liberation Army. 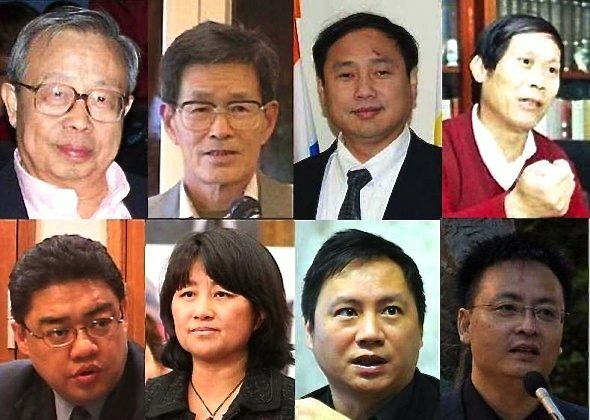 Listed here are brief biographies of nine who are recognized as leaders of the student democracy movement. Fang Lizhi, former vice president of the University of Science and Technology of China, and his wife Li Shuxian, supported the students during the protests. They entered the U.S. Embassy in Beijing the day after the June 4 massacre. Beijing police issued warrants for the couple for “inciting Wang Dan and other students to riot.” The Fangs stayed at the U.S. Embassy for one year before flying on a U.S. military plane to Britain. They arrived in the United States half a year later, and Fang received an appointment as professor of physics at the University of Arizona. Fang passed away on April 6, 2012, at the age of 76. Chai Ling was the student leader who initiated the hunger strike and was in charge of protecting Tiananmen Square Headquarters. After the massacre she was on the Chinese regime’s wanted list. She left mainland China through Hong Kong in April 1990, and arrived in Paris 10 months later. She later went to the United States to continue her studies. In December 2009, Chai converted to Christianity and as an expression of her faith founded the organization All Girls Allowed on June 1, 2010. The organization aims to expose the injustice of the one-child policy, end gendercide in China, and celebrate women as created in God’s image. On June 4, 2012, Chai published an open letter saying she forgave those responsible for the massacre, which immediately received harsh criticism from other Tiananmen Square survivors. Ding Zilin, the spokeswoman for the Tiananmen Square mothers, published an open letter in which she asked why Chai did not take responsibility for the mistakes she had made during the Tiananmen Square event. Feng Congde was also a student leader. During the protests he was an elected member of the Beijing University Preparatory Committee Standing Committee, president of Beijing University Students’ Autonomous Committee, vice commander of Tiananmen Square Headquarters, and vice commander of the Hunger Strike Committee. Feng escaped to France after the massacre and currently lives in San Francisco. Feng is the former husband of Chai Ling; the couple is now divorced. Presently, Feng is chief editor of the website 64memo.com, He and many other well-known scholars founded the Sun Yat-Sen School to promote Sun’s ideas of ruling a country. In May he published a revised version of his book June 4 Diary: The Republic on the Square. Wang Dan, who was the deputy commander of the square, was at the top of the regime’s student leaders wanted list. After the crackdown, he did not flee overseas, but hid in China. When Wang went back to Beijing and met with a reporter, he was monitored by police and arrested on July 2, 1989. In 1991 he was sentenced to four years in prison. After being released in 1993, Wang remained active in democratic and political movements. In October 1996, he was sentenced again, this time to 11 years. When U.S. President Bill Clinton was about to visit China in 1998, Wang was released on medical parole, and exiled to the United States. In 2008 Wang received a doctorate in East Asian History from Harvard University. In March 2012, Wang received a three-year appointment as visiting assistant professor at Taiwan’s National Tsing Hua University, College of Humanities. Wang continues to promote democracy and human rights for China. He has been nominated for the Nobel Peace Prize three times, awarded a Human Rights Award from The National Endowment for Democracy, the Prize for Outstanding Democracy Activists from the Chinese Democracy Education Fund, a Certificate of Achievement from Chan’s Foundation of Journalism and Culture in the USA, among other honors. Wu’er Kaixi, a Uyghur, was a leader in the 1989 student democracy movement and advocated evacuating Tiananmen Square. This caused a dispute with Chai Ling, and Wu’er was removed from his leadership position. But he remains an influential figure among the students of the 1989 movement. After the June 4 massacre, Wu’er became the No. 2-man on the Chinese regime’s wanted list. He fled China via Hong Kong and remained in exile for many years. Wu’er’s parents are old and in poor health. Saying that he wants a chance to see his parents again and to have the opportunity for a dialogue with the Chinese government, Wu’er tried to enter Macau for the purpose of turning himself in, in 2009. In 2010 he attempted to surrender himself to the Chinese Embassy in Tokyo, but was turned away. In 2012, he attempted to surrender to the Chinese Embassy in Washington, D.C.
Now settled in Taichung, Taiwan, Wu’er has noted that while he is still on the Chinese regime’s wanted list, “I managed to become the ‘most unwanted,'” according to USA Today. Wang Juntao oversaw the Zhao Ziyang Funeral Committee in China. He now lives in exile in the United States. Last year Wang provided consultation for the Jasmine Movement in China. Wang was imprisoned twice in China, first on April 16, 1976, when he was a 17-year-old high school student in Beijing’s October First School. The reason for the arrest was that he had organized two classes of student activities in Tiananmen Square during the Qing Ming Festival. He also published four poems, which were denounced as counterrevolutionary at the time. His second imprisonment was on Nov. 24, 1990, following the Tiananmen student massacre. Wang was sentenced to 13 years in prison, but was released on medical parole in 1994 and expelled to the United States. Wang obtained a doctoral degree in political science from Columbia University in 2006. In April 2010, during the special representative Assembly of the Chinese Democratic Party National Committee held in New York, he was elected co-chair of the committee along with Wang Youcai. On Jan. 11, 2013, Wang’s father passed way, and Wang was refused permission to return to China to attend his father’s funeral. Wang told Voice of America, if a person, or a system, doesn’t allow mourning of a loved one that passed away, then this person, or system, lacks the least bit of humanity. Su Xiaokang is a Chinese writer and is regarded as an honest reporter of the 1980s in China. After June 4, Su was wanted by Chinese authorities for being “behind the 1989 student movement.” He went into exile in the United States and is now the director of the Democratic China magazine. Yan Jiaqi was the director of the Institute of Political Sciences at the Chinese Academy of Social Sciences and an adviser to Zhao Ziyang’s office of political reform. Once, at a meeting with former CCP head Hu Yaobang, Yan proposed that the life tenure of Party top leaders be abolished. This did not agree with the CCP Central Committee. At the height of the political stalemate in the 1989 student protests, Yan Fuming, who was the secretary of the CCP Central Committee and head of the United Front Work Department of the CCP Central, invited Yan Jiaqi along with Bao Zunxin and other academics to help negotiate with the students. Together they tried to persuade the students to stop their hunger strike on May 13. Four days later, Yan, Bao, and others, issued a statement, saying that “abuse of unlimited power and an irresponsible and inhumane government” had led to a series of problems in China. They showed solidarity with the students by gathering signatures from intellectuals. On May 26, Yan Jiaq and Bao published an open letter to then-Prime Minister Li Peng. After the June 4 crackdown, Yan and others were listed as wanted by the Ministry of Public Security, and Yan was forced into exile. In 1989, Yan became the first chairman of the Alliance for a Democratic China, which was based in Paris. In 1994, Yan moved from France to New York, and became a writer and guest lecturer at Columbia University. During the student movement in May 1989, Bao Zunxin and other intellectuals went to Tiananmen Square, trying to persuade students to abandon their hunger strike. Later, authorities accused Bao of conspiracy and manipulation, and sentenced him to five years in prison. After his release from prison, Bao was under constant illegal surveillance, but was able to make a living by doing research and writing. He was also actively involved in the movement for democracy in China. Bao died on Oct. 28, 2007, from a stroke. He was 70 years old. In May 2012 the Dui Hua Foundation estimated that the regime currently holds less than 12 of the thousands who were detained in the crackdown. The group listed the names of seven people it believes are still in custody, saying they hadn’t gotten a response from the regime about such prisoners since September 2009. On May 31, the U.S. State Department issued a statement recalling the “tragic loss of innocent lives” due to the violent suppression of the Tiananmen demonstrations. “We renew our call for the Chinese government to end harassment of those who participated in the protests and fully account for those killed, detained or missing,” the statement said.